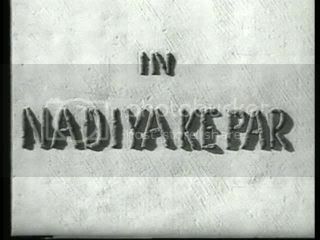 Nadiya ke par (1948) claims on the box that it shows the stars in cupid form. That is a lie. There are no small chubby children with loincloths and wings. Nevertheless, I have developed a liking for this movie and its catchy songs. It starts one dark and stormy night when a doctor who's presence has been requested by the local landowner gets off a train in the middle of nowhere, only to find that due to a communication mishap there is nobody to receive him. The station master's claim that there is no transport available is undermined by energetic neighing off-screen, but the journey is further hindered by the appearance of a river. There is a settlement of fisher folk nearby (some of whom are more than a little peculiar, especially a woman called Iriya (Gulab) who has issues with an older man called Damdi (Sampson); the reason for their strained relation will become clearer later) but they refuse to cross the river at night because it is haunted by a pair of lovers who drowned there 5 years earlier, and who won't let anyone cross the river at night. The doctor isn't convinced, but he can't persuade anyone to take him across. In the end, he ends up spending the night inthe room where one of the lovers, Phulwa, used to live. However, mysterious voices and things moving soon send him back out, where he is told the story of the two lovers; and we start with the movie proper. 5 years ago, the landowner's younger brother was expected back after having completed his studies. The landowner's accountant learns this news while he is visiting Thakur Gulab Singh (DAvid) who recently moved into the area with is daughter Chanchal (Maya Banerji). 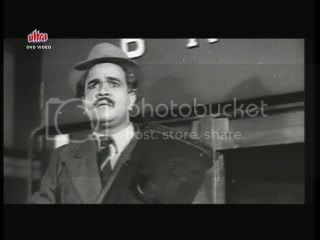 The Thakur is most interested in this news of the arrival of an eligible bachelor and tells his daughter to get their car so they can pick up Kuwar (Dilip Kumar) (for that is his name) from the train station, instructing her to wear the dress her mother wore for her engagement. Meanwhile, another reception committee including the accountant sets off on horseback. They have to cross the river, and the fisherfolk are not overly friendly, mainly because they refuse to pay, as they are the landlord's people. 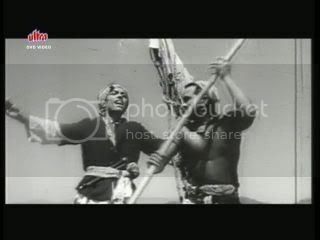 We already know some of the fishermen, namely the older gentleman with the impressive moustache, Damdi, and the one who is telling the story, Bala (Sushil Sahu), from the introduction. Grumpy fishermen notwithstanding, the men on horseback make it to the railway station in time to receive Kuwar and his friend, Sher Singh (Ramesh Gupta), who has also come for a visit (and to provide us with comic relief). On the way, Kuwar spots a deer and decides to go for an impromptu hunting expedition. It turns out, however, that the deer in question is the pet of one of the local girls. Her shrieking helps the deer to escape, which annoys Kuwar. After some discussion as to whether pet deer should wear collars or not, we check in with Kuwar's friend, and the rest of the reception committee who have met the Thakur on the road, as his car had broken down and his daughter is trying to repair it. He is instantly interested in the daughter and the interest is reciprocated especially as he introduces himself as Kuwar. 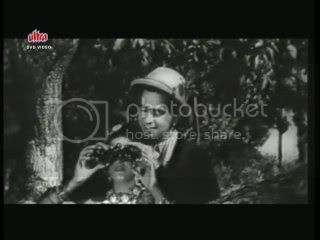 Meanwhile, Kuwar and Phulwa have come closer, and he introduces her to his binoculars. Alas, she spots one of her fellow villagers and, worried that she will be in trouble when they see her talking to a stranger, she leaves. The new arrival is Bala, who is very friendly with Phulwa and complains about her habit of breaking pots. 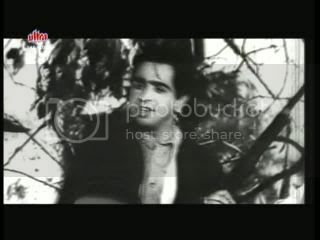 Kuwar makes his way to the river and asks to be taken across and even offers to pay for the journey. Not unsurprisingly, he finds it much easier to secure transport than the accountant before him. 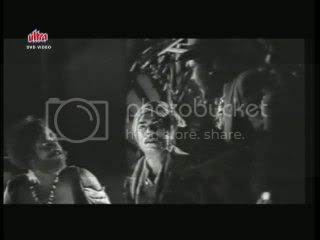 Phulwa then starts to sing about how her beloved is crossing the river, much to Bala's joy, who answers in song, though it is rather obvious that he is really not the object of her song. Of course, she couldn't hold them on her own, could she. At the Thakur's place, Kuwar's friend and the Thakur's daughter are getting closer, with much encouragement given by her father. The two young people celebrate their new-found fondness of each other with a song, again with Dad's enthusiastic encouragement. 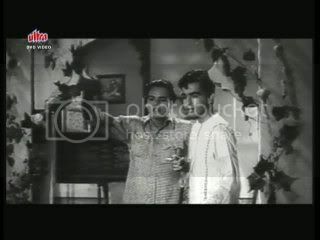 Kuwar and Sher Singh spend the night at Thakur Gulab's place, and the next day the whole party sets off for a fishing expedition. 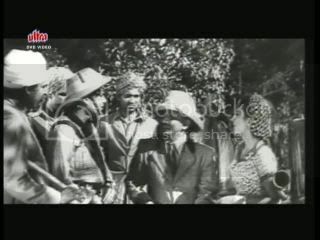 The Thakur, still under the impression that Sher Singh is Kuwar, drags off the real Kuwar to show him some interesting bushes and to give the two lovebirds some privacy. However, the botanical lecture is cut short when Kuwar spots Phulwa's deer which leads him to her owner who is taking a bath in the river. 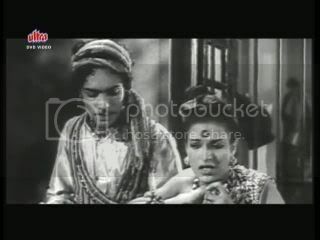 Kuwar and Phulwa continue their flirting for a bit, but when she wants to get out of the river and he won't move, she swims further along only to be attacked by one of my favourite protagonists of Hindi cinema: The fake crocodile. 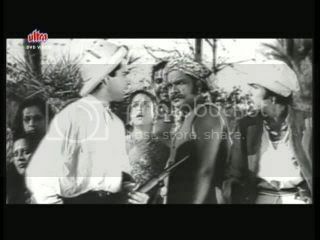 Kuwar comes to the rescue and shoots the beast, but the sound of his gun attracts the other villagers. 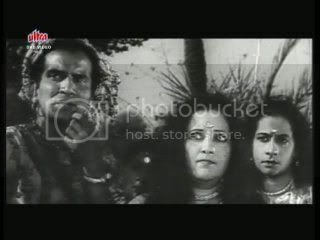 Damdi isn't too impressed to find his daughter in Kuwar's company, who is the son of his enemy, after all, and Bala does his best to fan the flames, claiming that Kuwar only came to the river to seduce Phulwa, while his mother claims that she killed the crocodile with magic (Bala's mother does come across as rather differently sane throughout the entire movie). The whole situation quickly deteriorates, and in the end only Phulwa's intervention prevents Damdi, Bala and Kuwar from coming to blows, which earns her a slap from her father. Suspicious, us, whatever gives you that idea? We then meet Kuwar's older brother, the landlord (Hari Shivdasani), who provides us with a bit of useful exposition concerning the enmity between Damdi and his family. Apparently, Damdi has a habit of stealing from the landlord's stores and was responsible for his (the landlord's) father's death, but there has never been sufficient evidence for an arrest. 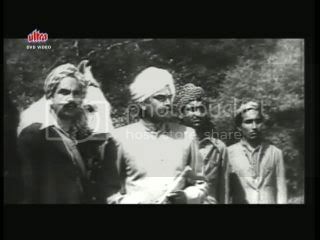 Kuwar and Sher Singh arrive, and get told off for having spent the night away from home. We also meet Kuwar's sister-in-law, Pushpa (Kanta Kumari), whose main aim in life seems to be to see her brother-in-law suitably married (no, I don't think Phulwa would be considered suitable). Meanwhile the fisherfolk are planning to go to the market. There are other plans afoot too, namely a robbery of the landlord's stores when his accountant goes for his evening walk, planned by Bala and Damdi. When the villagers pass the landlord's house on their way, while singing, Phulwa makes very sure that Kuwar knows where she is going. Kuwar, grapped by a sudden desire to purchase fish, together with Sher Singh who insists on coming along, goes to the market and there more or less subtly agrees with Phulwa to see her that evening. Alas, his brother has some trouble making sense of the accounts, and ropes in Kuwar to help. 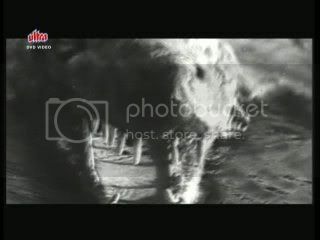 Many hours and a sad song on Phulwa's part later, Kuwar finally makes his escape and the two take a nocturnal trip on the river, which leads to a very catchy song indeed. In the meantime, Pushpa has observered her brother-in-law's behaviour and come to the (correct) conclusion that he is in love. 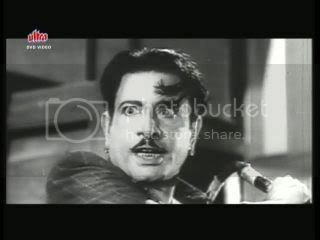 However, she is rather far off the mark where the object of his affection is concerned, as she assumes this to be Chanchal, who has indeed written a letter to Kuwar, only of course she still thinks that Sher Singh is Kuwar. 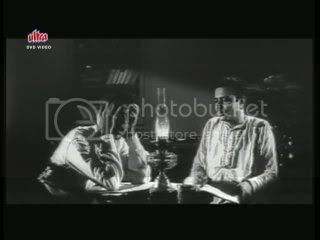 Pushpa isn't to keen on Chanchal who is too modern for her taste and has a rather eccentric father, but the landlord is in favour of the match, and not too worried about Chanchal's trouser-wearing (which, of course, isn't such good news for Kuwar, who has no interest in Chanchal). 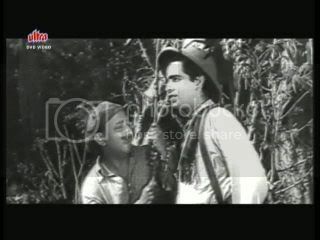 When Kuwar returns from his romancing, he learns that Damdi has broken into his brother's storeroom, which is near Thakur Gulab's house, and has attacked the accountant (this is obviously a more dangerous occupation than is generally appreciated). 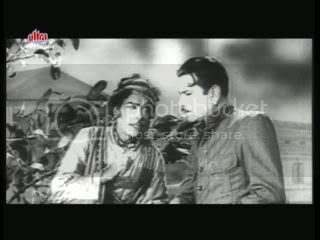 He has been apprehended, and the landlord, Kuwar, and Sher Singh set out to deal with him, or rather, the landlord sets out to deal with him, and the two younger men follow him on Pushpa's insistence, as she is afraid that her husband might do something rash. 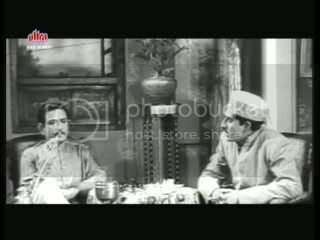 Of course, this means that Thakur Gulab learns the true identity of Sher Singh and Kuwar, which leaves both him and Chanchal rather underwhelmed. The situation provides the perfect opportunity for Bala to do some intriguing. 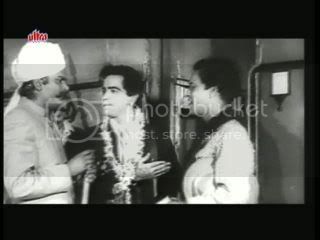 He tells Phulwa that her father was beaten up because the landlord disapproved of her relation with Kuwar (which he does, only that wasn't why he beat Damdi - half-truths are always so much more effective); and he tells the landlord, that Damdi encouraged Phulwa to entice Kuwar to ruin the landlord's family's reputation. Wouldn't it be so much better if Phulwa got married to a man able to control her as soon as possible (and by the way, wouldn't he be the perfect husband material)? The landlord is very concerned by this news (a girl in trousers he can cope with, the daughter of his father's killer, less so) and is prepared to release Damdi as long as he promises to get his daughter married and stop her from bothering his brother. Damdi decides to get his daughter married the traditional way; that is, having her marry the winner of a boat race. Phulwa isn't glad to hear this, but things look up somewhat (temporarily) when the same night, Kuwar sneaks into her house with the help of a friendly villager, and at least manages to convince her of his love for her. Unfortunately, he is spotted by Damdi and ends up being beaten badly. His brother is decidedly underwhelmed when he learns that Kuwar was beaten up by the villagers. 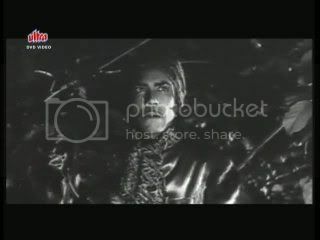 He decides to put an end to this Phulwa business once and for all and approaches Thakur Gulab Singh to ask for Chanchal on his brother's behalf. 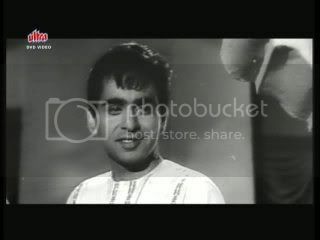 The Thakur is more than happy to agree (he has debts with the landlord, which is partly why he is so keen to get his daughter married to Kuwar) and after a liberal dose of emotional blackmail (including that staple of well-adjusted family relationships: threatening suicide), Kuwar agrees, too. What will happen next? Well, we know Kuwar and Phulwa are going to die, the question is how and when. Whose family will be responsible for their death. Will either of them be married to someone else? How will Sher Singh and Chanchal cope with the sudden turn in their fate? How many more songs will there be? 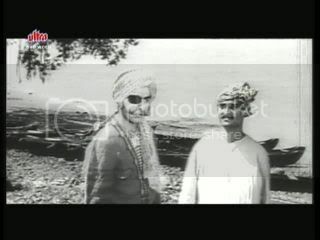 And who is this guy with the eye-patch and how does he fit into the story? If, like me, you are a fan of melodrama, and like 40s music (and there is plenty of it), as well as a nice tale of star-crossed lovers, this is a good movie to enjoy. 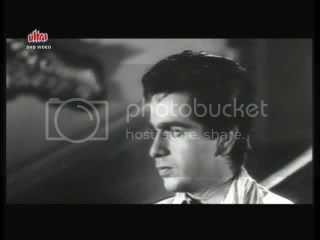 I prefer it to Arzoo, which is of the same vintage, and also stars Dilip Kumar and Kamini Kaushal, because the story holds together better, misunderstandings between the lovers are cleared up quite swiftly, rather than pivotal parts of the story revolving around people lacking vital pieces of information. 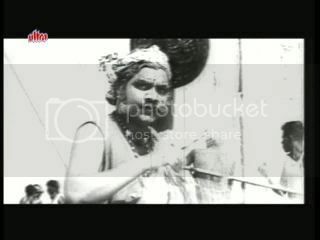 It is also interesting that Bala isn't portrayed as evil, it's his love for Phulwa and his self-interest which lead him to act in a way which ultimately causes tragedy, and leaves him alone and full of remorse. Nicely done! I love the post and all the screen caps. thanks! 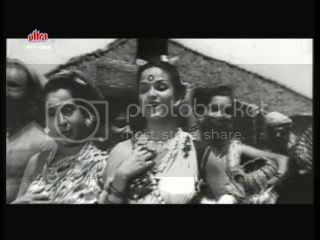 I just saw this film a week or two ago; now I am definitely a fan of Kamini Kaushal. 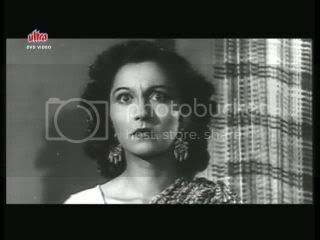 (In fact, I just recently did a Kamini Kaushal birthday post. 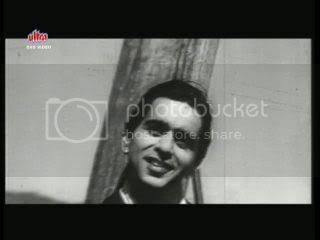 :) ) I love Surinder Kaur too, and she does great singing here. 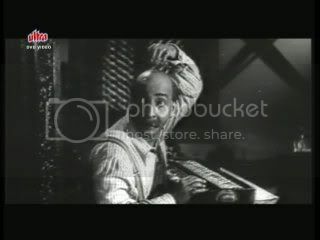 That is a fantastic soundtrack by C. Ramchandra! By the way, I see this is a fairly old post. Hope there will be new ones soon?